The Invacare Top End Paul Schulte Signature BB chair is targeted for elite player and delivers custom built performance in a welded-to-perfection design suited for the play making guard, power forward or big man position. No bolts to loosen up or extra weight to slow you down. What's new for the 2008 season? Lots. First, an adjustable center-of-gravity options and the "smart" fork system features bearings that are inset into the fork, which translates to faster, smoother turns and caster caps that NEVER FALL OFF. Second are the adjustable height anti-tip bars that are available in single or double swivel. Then we have three wing options available-the four-bend wing which is compact and great for dribbling, the round wing with round gussets for smooth turning and the omit wing/bumper choice for a more defensive set-up. 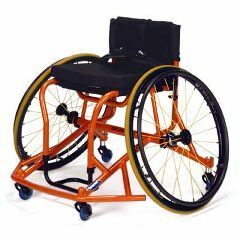 For double amputees, we have the double amputee front end option designed for maximum effeciency and performance. Last but not least, now you contact Paul Schulte himself for chair setup questions, etc. He works here at Top End as one of our design engineers. He can even e-mail you a CAD drawing of your chair before it is built or handle any special custom requests you may have. Just call 1-800-532-8677 for more information.